At Neeshat Khan, DDS, Dr. Neeshat Khan and her staff offer dental implants and other types of restorative dentistry. Patients who live in the San Jose, California area are provided with the highest quality of health care available. Dental implants are used to fill in gaps that are left behind after a tooth has fallen out or been extracted because of damage or decay. A dental implant is a metal rod or post that is attached directly to the jaw bone. The post is placed into a small hole that has been drilled in the bone. The bone will remodel around the post, holding it securely in place. Once the bone has grown around the post, the dentist will replace the temporary crown with a permanent one that is designed to last for several years. Dental implants are designed to be permanent since they are attached directly to the bone. Even if the crown needs to eventually be replaced, the post is permanently attached to the bone. Dental implants are designed to become permanent structures of the mouth. The post is implanted directly into the jaw bone and the bone is allowed to remodel around it, permanently securing it in place. When the implant is placed into the jaw, a temporary crown is used to cover the top of the post and give the visual impression that none of the teeth are missing. Once the bone has grown around the implant and it has healed completely, the dentist will remove the temporary crown and replace it with one made of gold or dental grade porcelain. With proper care, the new crown is designed to last for many years. Can Dental Implants be Used to Replace More Than one Lost Tooth at a Time? Dental implants can be designed to accommodate for the loss of two or more teeth. Separate crowns may be used or a bridge may be designed that snaps onto the implanted posts. This type of appliance can be removed as needed or the dentist may attach the crowns permanently to the posts. When a tooth, or teeth, are lost, it is important to close the resulting gap. This prevents the teeth on either side from shifting into the opening and disrupting the alignment of the jaw. 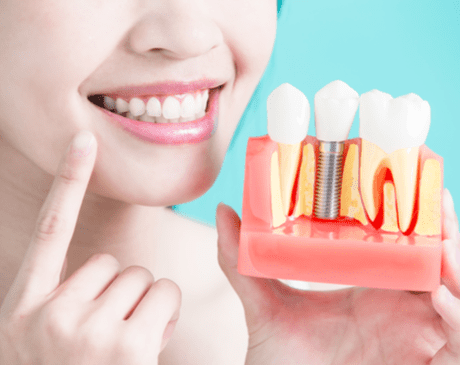 Dental implants offer a permanent solution to the problem, especially for younger people who want to maintain the appearance of a healthy looking mouth.